There’s all sorts of car deals going on at the moment, some of them are very short term in an effort to ‘shift the metal', though serious car buyers should always shop on the basis of the product’s track record and then see what deals are available. Skoda’s Superb flagship model range is what I call a real deal. Not so long ago I waxed strongly on the value and merits of a near range topping 2.0-litre Elegance model which gave a good bit of change out of £25,000, now I state the case for those who really want their cake and eat it. 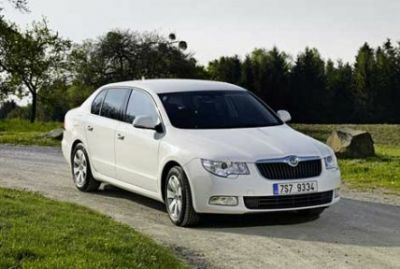 It comes in the form of the Skoda Superb 2.0 Greenline version that also has a 2.0-litre turbo diesel engine, though producing 105 bhp as opposed to the 170 bhp output of the Elegance and comes with a conventional 5-speed manual gearbox in place of the impressive DSG selectable automatic unit. Here is a price saving of nearly £8,000, a lower road tax and at least another nine miles or so (a combined figure of 55.4 mpg as opposed to 46.3 mpg!) to each costly gallon of oil at a sacrifice of about 18 mph off the top speed and clearly slower acceleration. Fact is, a claimed top speed of 120 mph is hypothetical for all law abiding drivers in this, and most civilised countries, and an acceleration time to 60 mph of about 12 seconds is very acceptable considering this is a larger than average five-seat family/executive class car. Worth also taking into consideration is the excellent flexibility and quiet refinement of the 4-cylinder diesel engine that is complemented by an accurate and light changing transmission and an impressive handling response, both through the steering and the all-disc braking system. The ride quality is good, perhaps a little firmer than the Elegance version and that could be a result of the Greenline version having a slightly lower ride height, though it remains very competent on our noticeably deteriorating road surfaces. Yes, there is a heck of a lot to the Skoda Superb, even this Greenline version, which is just one above the S entry level version but it is certainly not lacking equipment. It builds on the excellent standard package with the addition of the now all important cruise control (all versions have a speed warning indicator system), some smart chrome trim bits, a boot spoiler, tinted rear glass and, would you believe, an umbrella in one of the rear doors! Why the Greenline designation? One important reason is that it is the greenest version in the range with a CO2 figure of 136g/km achieved by the use of a Diesel Particulate Filter (DPF). This filter cleans the emissions before they reach the atmosphere and regenerates when longer journeys are undertaken. Every little helps! Without considering the price or the fact that the Skoda Superb comes with a 5-star EuroNCAP safety rating, this car gives me a feel good factor, it is an honest to goodness offering, generous in the extreme, truly practical with a enormous boot that can be accessed either by opening the boot lid or the whole of the tail-gate – a saloon that is also a hatchback and above all extremely refined and utterly comfortable. Even Ebenezer Scrooge would approve! RIVALS INCLUDE: Citroen C5 1.6 HDI SX £18,195, Peugeot 407 1.6 HDI £19,785, VW Passat 2.0 TDI Blue Motion £18,655, Renault Laguna 1.5 DCI 110 Eco2 £17,750.